Usage/Application: Hotel, Restaurant, Commercial Kitchen, etc. For mixing various ingredients including flour, sugar, fat, water and other chemicals for making various types of soft dough, hard dough and cracker types of biscuits. 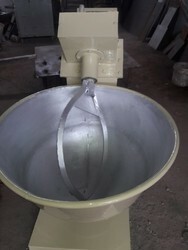 We are offering Horizontal Dough Mixer. 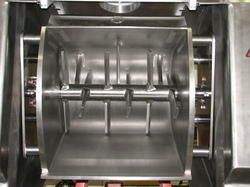 It is used for uniform mixing and kneading heavier viscosity materials. Horizontal mixer fits with double. Z. sigma type arms, movable in opposite directions with different speeds. which will be capable to mix and knead all types of soft and hard dough (Sweet and salt) There will be two helical gears on both sides of sigma arms. There will be a worm gear and pinion attached to the machine to tilt the mixing bowl up and down Avaliable Cap. 30-60-100-200-300 Kgs.